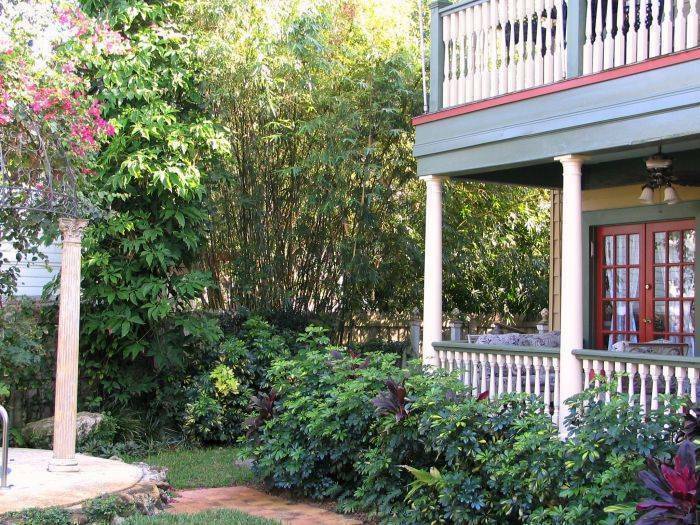 Larelle House offers 4 antique-appointed guest rooms, open verandahs, lush landscaped grounds, and a gazebo covered in-ground hot tub for relaxation. 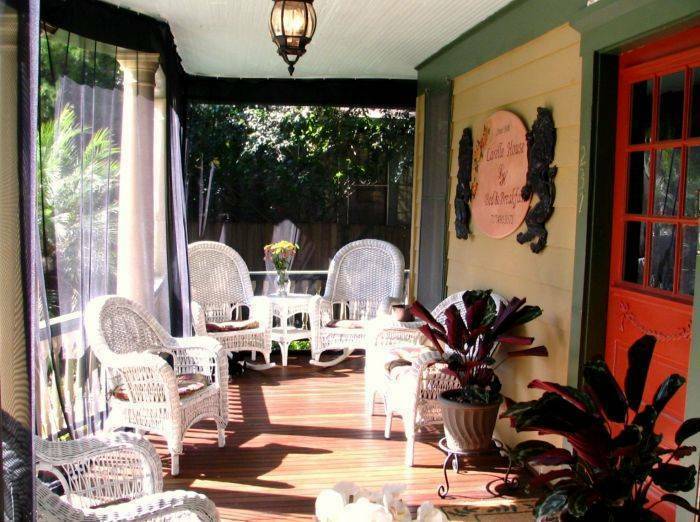 With scrumptious full hot entrée breakfasts and an abundance of amenities, Larelle House seeks to provide every comfort and exceed all expectations. Each evening, enjoy wine & cheese in the parlor together with your hosts if the guests should so choose. Soft drinks and homemade goodies are available in the dining room mini-refrigerator around the clock. Unwind in the evening while privately soaking in the custom in-ground hot tub under a columned Grecian gazebo crowned with flowering bougainvillea. Or you may wish to cruise the neighborhood or waterfront on our bicycles, which are available for our guests to use as they wish. 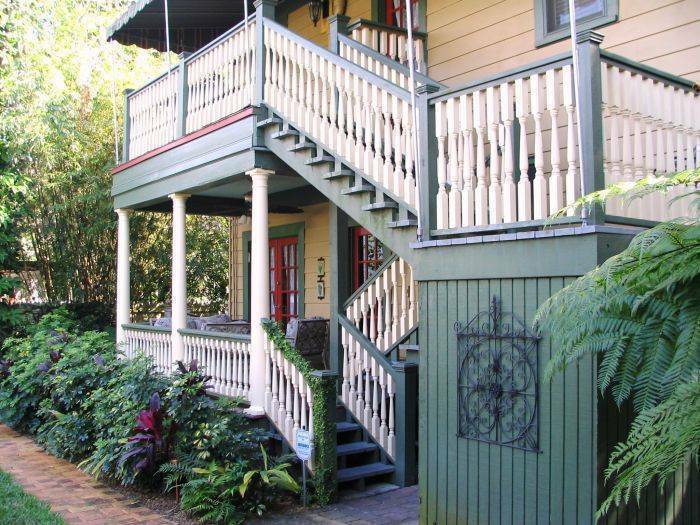 The inn is equipped with high speed wireless internet access for personal laptops. Printing, copying, faxing and scanning are all available. Unlimited local phone calls are free. We also provide luggage storage for late departures. The Lavinia room is beautifully decorated with a massive four-poster queen-size bed gracefully draped with sheer fabric under a damask ceiling framed with intricate crown molding. It features a bay window facing the front lawn with a view of the quaint cobblestone street beyond. The ornate writing desk is perfect for tending to business or writing letters to loved ones. The private bath is appointed with an antique clawfoot tub/shower combination and pedestal sink. The Victorian room is made for romance with its antique iron queen-size bed floating under a high ceiling embellished with purple flowers and bordered with ornate crown molding. An intricately inlaid wood dresser accents a corner and a duo of needlepoint chairs paired with a table topped by a Tiffany lamp beckon intimate company and conversation. It is a large corner room with custom draped windows overlooking the front lawn and side garden accented with a four tiered fountain. The private bath features an antique clawfoot tub/shower combination and pedestal sink. The Longley room features a mile high intricately carved antique mahogany king-size bed situated under a high ceiling of romantic purple flowers edged by detailed crown molding. A Victorian lamp with a delicately fringed shade adorns a mahogany table whose legs are carved into graceful swans. An antique secretary and stool – perfect for writing out postcards to folks back home – completes the room. The private bath features a period pedestal sink and antique ceramic tile surrounding the combination tub and shower. 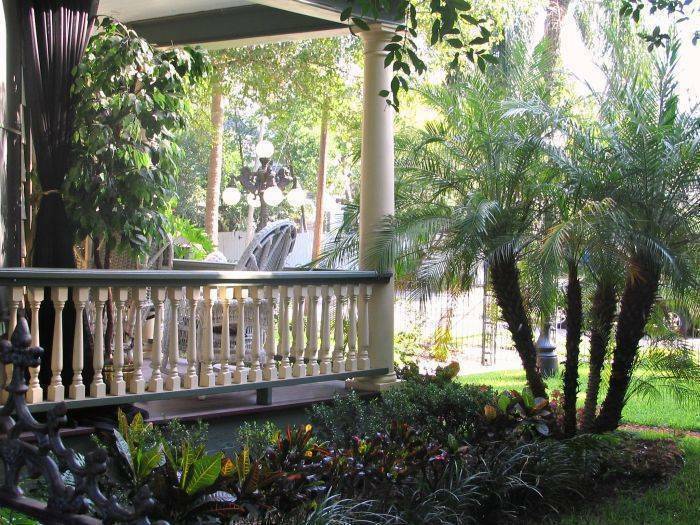 The Hemingway room is tucked in the back corner of the house and features exclusive access to its own open-air porch overlooking the rear garden and hot tub gazebo. 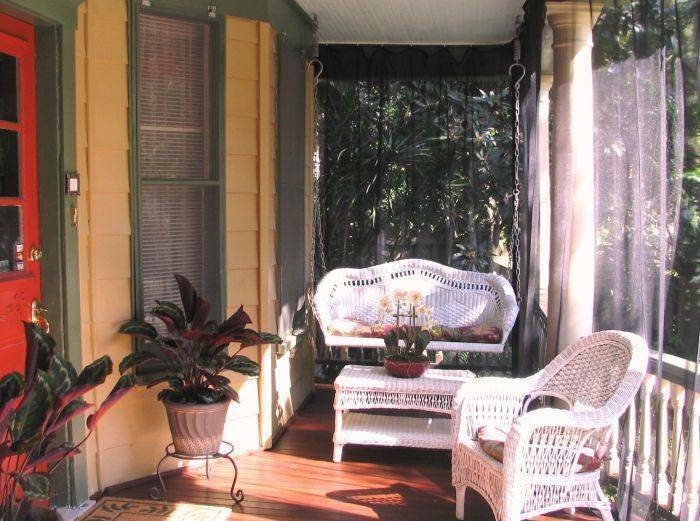 Decorated with a writer in mind, it features an Old Florida motif with treasures gathered over years of world travel. A handsome secretary desk stands ready with an antique manual typewriter waiting for inspiration to strike. The antique iron full-size bed is romantically draped with netting suspended from the ceiling and a Tiffany style ceiling fan stirs a soft breeze. The small private bath across the hall is equipped with a built-in ceramic tiled tub and shower. 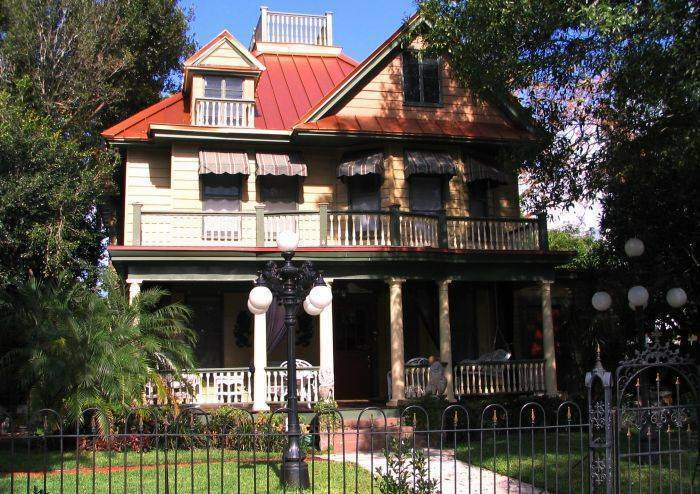 We are in a perfect location - nestled in the serenity of the historic Old Northeast residential district - yet less than two blocks away from the always happening St. Petersburg waterfront and bustling downtown. Easily walk or bike to The Pier, Baywalk, Vinoy park, North Shore Park and beach, marina, shops, restaurants and the many bayfront attractions and special events. Larelle House in St. Petersburg is centrally located in the Tampa Bay Area within an easy drive to Tampa, Clearwater, Bradenton and Sarasota, and only minutes to Pinellas Counties’ beautiful and world-renowned gulf beaches. Very Fine dining at the Vinoy Renaissance Resort. Fine dining by Tampa Bay. Fine dining and craft beer 1 1/2 blocks away. Good seafood in the heart of downtown. Rates do not include taxes & fees. Rates may vary during special events. No penalty if cancellation is made 7 or more days prior to stay. Cancellations made with less than 7 days' notice will be charged one room night unless the room can be rebooked. We are located close to I-275, which runs North/South through St. Petersburg. Exit I-275 at exit #23A onto I-375 (It is a left-hand exit when travelling South). Stay on I-375 to the end (about 1 mile) and it becomes 4th Avenue N. Continue towards Tampa Bay and at end of avenue turn left onto Beach Drive NE. Travel through traffic light into the Old Northeast and make the first left onto 6th Avenue NE. Larelle House is #237 on the right. Temporarily park/stand and we will direct you to free, onsite parking at the back of the property. Taxi's and shuttles are readily available to take you to and from the local airports. Local bus service is available, along with a looping trolley system in the downtown area.